Possibly Acura RSX Type R in the future. Actually, this is an Honda Integra Type-R, since for the US there's still no RSX Type R, but since this is basically what the RSX-R will be, I've put it this way. Note how this performance closely matches that of the S2000's. This new Type-R is a real screamer. 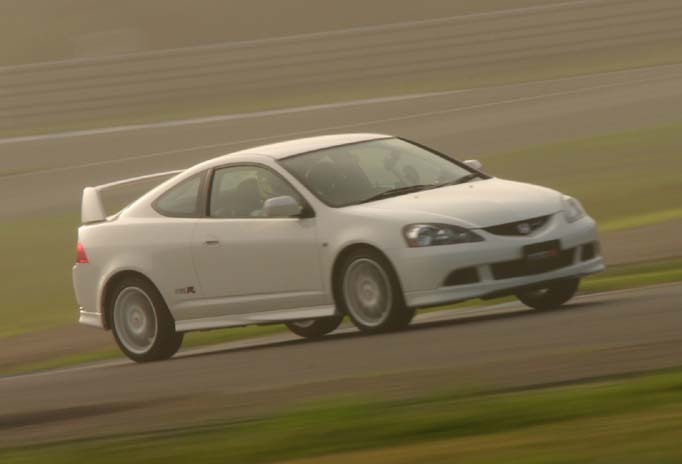 While retaining the high 8400 rpm redline, it gains 22 more horses over the previous Type-R. The only reason why it's performance could be a bad thing, is that it's so close to the S2000's, honda could be afraid that the Type-R would steal sales from the S2000, but still that is not likely to happen, mostly because their different body styles and layout (FF vs. FR). The tires are 215/45R-17. That can be a wonderful setting in a car weighting only 2579 pounds. While I don't know if it will handle as well as last year's did, I can tell that it is a huge improvement over that car. Finally Honda is learning that they are capable of creating the best cars on earth. Just see how many Comparisons they have won the latest magazines. Now all we have to hope for is that they follow the same path with the upcoming NSX V-8. UPDATES: Like the RSX Type S, the Integra R has recieved the exterior changes. However, mechanically, it doesn't seem to have changed (I don't understande japanese, so I don't know what the website says). The engines remains with 217 bhp, but don't let that decieve you. The R is several pounds lighter than the Type S, which is what makes it so much better handling and speed-wise.